Participants charge on after being flagged-off. 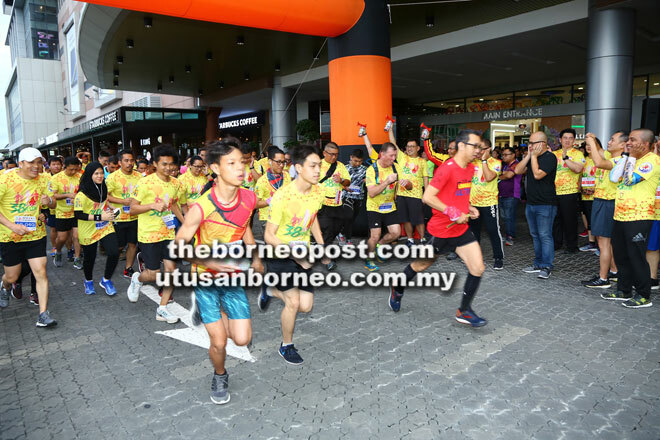 KUCHING: About 1,000 runners participated in the ‘38 Blood Run’ in conjunction with Sarawak-level World Blood Donor Day 2018 at Vivacity Megamall here yesterday. Themed ‘Be There For Someone Else. Give Blood. Share Life”, the event was declared open by Deputy Minister of Domestic Trade and Consumer Affairs Chong Chieng Jen, who also took part in the 10km run. As part of the run, free health screenings and health exhibition were held to assist the public to understand what a healthy lifestyle is all about. According to Health Department (Medical) deputy director Dr Kamaruddin Lajim, about 150 packets of blood were needed in all hospitals in Sarawak daily. In Kuching alone, at least 500 packets of blood were needed a week to supply all government and private hospitals. As part of the Ministry of Health’s healthy lifestyle campaigns, Dr Kamaruddin said the ministry aims to reduce by 10 per cent of the Malaysian population who practised sedentary lifestyle by 2025, in line with the World Health Organisation’s (WHO) target. Based on the National Healthy Morbidity Survey (NHMS) 2015, 33 per cent of adults in Malaysia did not practise an active lifestyle. Organised by 38 Media and SGH Blood Bank, the run was held on the same day as the National Sports Day, in order to increase awareness about the importance of blood donation, and promote a healthy lifestyle. SGH director Dr Chin Zin Hing, Kuala Lumpur National Blood Centre director Dr Noryati Abu Amin, Kuching Youth and Sports officer Mohammad Shukeri Drahman and 38 Media manager Ted Vong were among those who came for the programme.